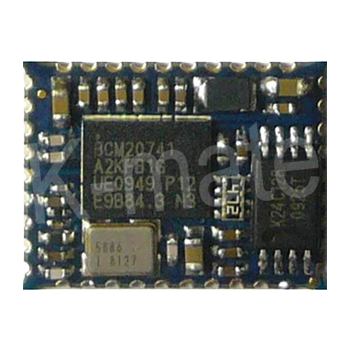 The K-mate KMBT012 is a Bluetooth monolithic Module solution for dual microphone mono headset applications with radio, baseband, application ROM, power management, mono dualmicrophone codec, and many other components typically required for low cost headset designs, making it ideal for low-cost, footprint challenged headset designs. The KMBT012 also delivers differentiating features including enhanced audio quality, and reduced charging times, and multipoint connections through the integration of various noise suppression technologies, circuitry, and application profiles. It is a ROM-based noise and echo reduction headset, enabling a revolutionary reduction in the bill of materials (BOM) for high-end and midrange mono headsets. The KMBT012 is designed for enabling features and audio quality that are usually available only for high-end products, but at a fraction of the cost of existing solutions. The KMBT012 supports the Bluetooth 3.0 standard, adding enhanced power control, simple and secure pairing, and enhanced inquiry response as value-added features for Bluetooth headsets. 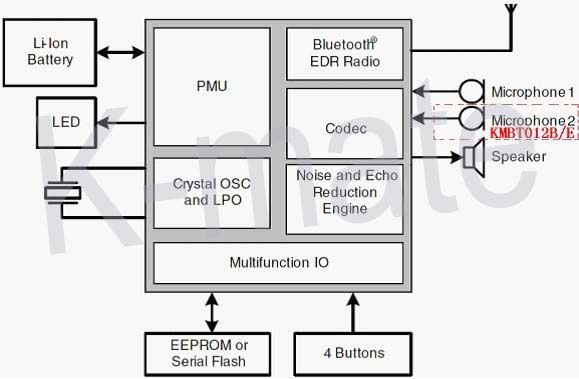 All major functional blocks required for a mono headset, including PMU, charger, and audio codec are integrated into a single package providing low system cost, ease of implementation and high product yields.